A 21-year-old man was arrested after a touchline incident with Rangers captain James Tavernier during his team’s 1-1 draw with Hibs on Friday. SPFL chief executive Neil Doncaster said in a statement: “We utterly condemn the reprehensible behaviour shown by the individual who invaded the pitch on Friday night in the match between Hibernian and Rangers. “We welcome the comments made by Hibernian chief executive Leeann Dempster in tackling unacceptable conduct. 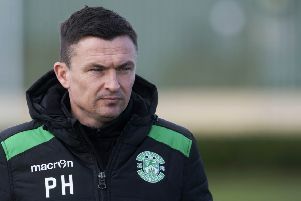 Hibs chief executive Leeann Dempster claimed “nothing was off the table” in terms of the club’s response to the matter. PFA Scotland called for candid and open talks about addressing player safety following the flashpoint, which followed a series of missile-throwing incidents this season, including one at Easter Road the previous weekend when Celtic’s Scott Sinclair was targeted with a glass bottle.